Ford Tourneo Courier light commercial vehicles are pictured at the Ford Otosan plant in Turkey. ANKARA (Reuters) -- Ford Otosan, the Turkish arm of Ford, cancelled an extra working shift on Tuesday, citing supply chain problems amid widening labor unrest in Turkey's automotive sector. Production at two major carmakers, Oyak Renault and Fiat's joint venture, Tofas, which both account for more than 40 percent of Turkey's annual car production, was halted earlier this week due to demands for better working conditions. Ford Otosan said production would restart once supply issues were solved. 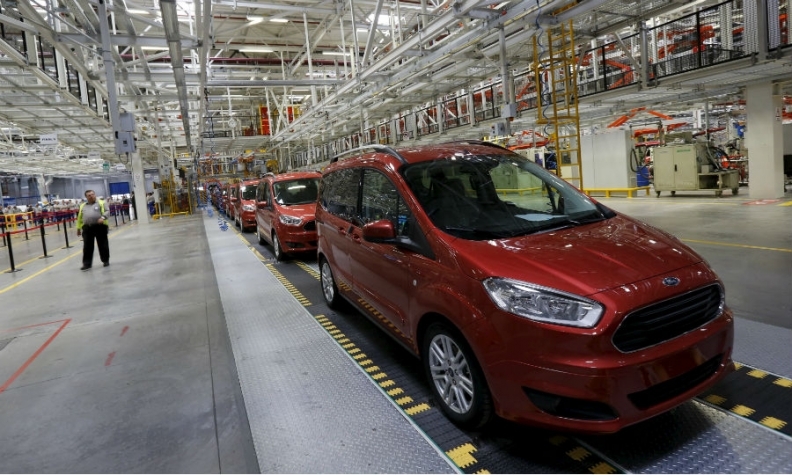 "As it was not possible to supply parts from intermediate product makers in Bursa, the preplanned extra working shift has been cancelled," Ford Otosan said in a statement to Reuters. Ford Otosan builds the Transit, Transit/Tourneo Custom and Transit/Tourneo Courier vans. The protest started on Thursday at Oyak Renault. The plant is a joint venture between Renault and the Turkish army pension fund. On Friday, the dispute spread to a Tofas plant. Tofas, owned by Fiat and local conglomerate Koc Holding, said it had halted production until the labor action was resolved, adding it did not expect the stoppage to affect sales.